Ladies! Come for time in the Word, spiritual renewal, relaxation and conversation. Experience fun activities for the adventure seekers or choose to take in the beautiful surroundings and simply sit back, relax and enjoy time together or alone. 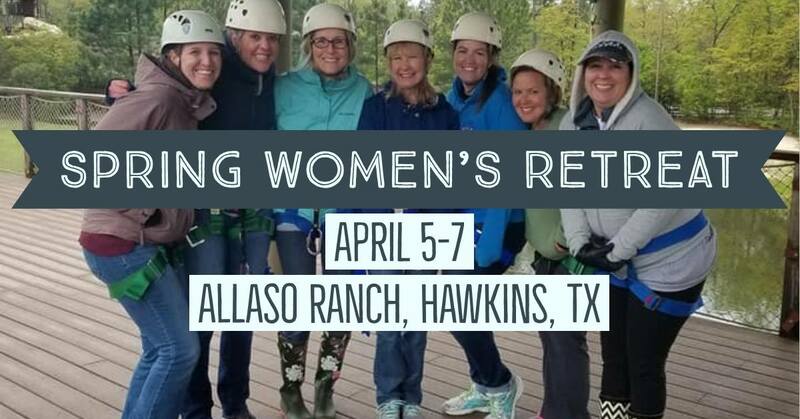 *Allaso Ranch is able to accommodate special dietary needs by request at registration. “Rejoice always, pray continually, give thanks in all circumstances; for this is God’s will for you in Christ Jesus,” (1 Thessalonians 5:16-18). What is prayer? What does the Bible say about prayer? Prayer doesn’t have to be hard, and it shouldn’t be intimidating, but we sometimes perceive it as both. Join us this April to study and grow in this discipleship habit! Is there a right way to pray? What if God doesn’t answer our prayers? Come on the journey from the Old Testament Psalms, to the New Testament words of Christ, right into our own messy lives, today. In our Bible sessions, we will be focusing on Prayer and the power it holds in our lives. What is prayer? What does the Bible say about prayer? Prayer doesn’t have to be hard, and it shouldn’t be intimidating, but we sometimes perceive it as both. Join us this April to study and grow in this discipleship habit! Is there a right way to pray? What if God doesn’t answer our prayers? Come on the journey from the Old Testament Psalms, to the New Testament words of Christ, right into our own messy lives, today. We are excited to welcome Cindy Koch from the 1517 ministry team to lead us in our topic of Prayer this year! Cindy Koch is a southern California resident and pastor’s wife. She loves her husband, Paul and adores her five children. This gift of family is what drives Cindy’s desire to write, teach and speak on the true Word of God. Cindy earned her BA from Concordia University, Irvine and an MA in exegetical theology from Concordia Seminary, St. Louis. She is a frequent blog contributor to thejaggedword.com and 1517legacy.com. Cindy speaks at women’s retreats and conferences around the country. Family Style Theology is a brand-new podcast which Cindy hosts. It features roundtable conversations with her children about theological topics. This podcast and Cindy’s book Woman: the forgotten Story can be found at 1517legacy.com. For any questions, please contact Colleen Hildebrandt.